A Golden Book, New York, 1974. 69 pages. 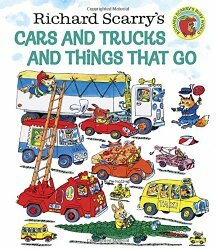 Today I was reminded of my son's favorite book when he was a toddler: Richard Scarry's Cars and Trucks and Things That Go. 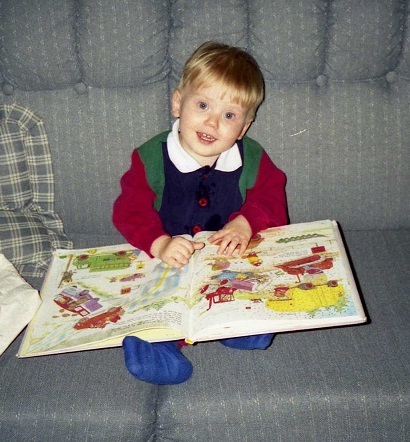 Tim is now 20 years old, but when he was a year old, we checked out the book from the library and spent the entire two weeks (or three weeks? I don't remember) reading it over and over. If you aren't familiar with this book, it's basically a story of a pig family going on a picnic. Each extra-large spread shows a different stage of their journey, and they pass every kind of vehicle imaginable along the way. There is a simple storyline about the family's trip, but the busy pictures are all labeled, and Goldbug shows up on every page, and there are many other things to spot. The book does, however, take a long time to read. You can try to skip all the extra pointing and only read the story about the pigs, but your child may or may not cooperate with that. So it was with some relief that I turned the book in, when we went back to the library. I was perhaps a bit furtive in the action, and I'm sure I buried the book under others, but I checked out several new books to distract him. It wasn't until the next morning that he asked to read Cars and Trucks and Things That Go. I don't remember what words he used -- he still wasn't very verbal (Though he could say "Car.") But I knew what he was looking for and said, "Oh Timmy, we took that book back to the library. It's all gone." My son did not take kindly to that news. He went to the back door (the one we used to go to our car), and began a full-fledged temper tantrum, complete with banging his head against the sliding glass door. If I was so horrible as to take the book to the library, then we must go to the library RIGHT NOW! Well, I survived and managed to not give in to the terrorist. But his dad was on a band trip and was coming back that very day. He liked to bring our sons gifts when he was on a trip. So I called him up and told him that if he had a chance to go to a bookstore (I knew he was staying near a Big Box Borders -- they were still new), well, I knew just the book that Timmy would love. Okay, so what made me think of that old story today? It so happens that my younger sister Marcy (Much younger -- she'd never heard this story) has a sweet toddler daughter. Tim and I got to stay at their house in Oregon on our vacation last month, and we both completely fell for her. Yeah... when our daughter has a meltdown because "Caws and Tucks" has been returned to the library... we all knew how that was going to end, right? Fortunately for us, she's too young to see a connection between a tantrum and a book arriving THREE DAYS from now. Dang it, this means I'm going to have to keep reading it. Frog and Toad it isn't. Oh well. At least she's ridiculously adorable when she reads it. Now, as far as I can remember, this is the only book either of my sons ever threw a tantrum about returning to the library. And now my niece has thrown a tantrum about the very same book! So, consider yourself warned! If you check this book out for your child, you may find returning it a challenge. Cars and Trucks and Things That Go: Discriminating toddlers demand nothing less.